So close in fact if it weren’t for a series of unfortunate events that occurred in the last 4.7 seconds of regulation, the Cavaliers might have been walking out of Oracle Arena with a statement-making win over the heavily favored Golden State Warriors, shocking the entire NBA in the process. Although, this outcome wasn’t meant to be. Despite giving the “dubs” all they could handle in the first four quarters, not even a historic 51-point performance from LeBron James was enough to overcome Golden State in the end. 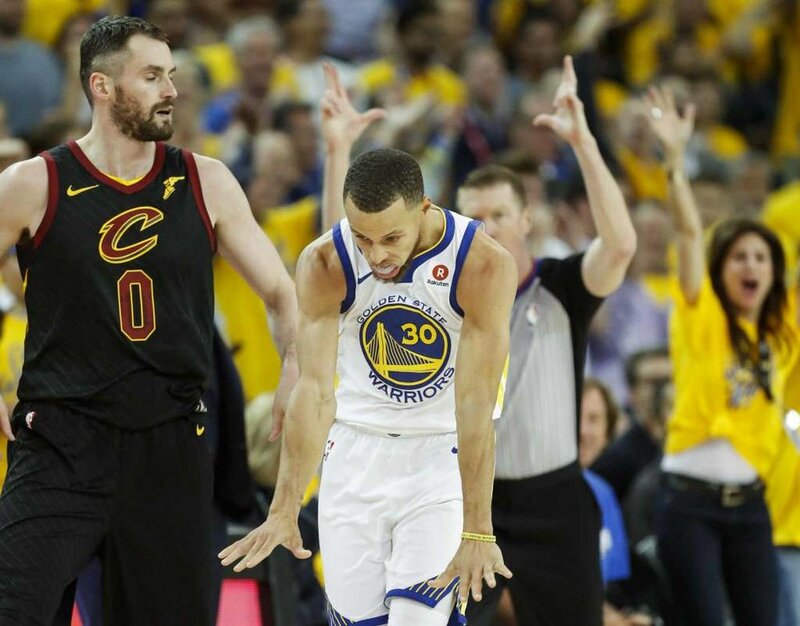 Spearheaded by a decisive 9-0 run in the beginning of overtime, the Warriors broke away from its familiar NBA Finals opponent of the last four years, outlasting the Cavaliers in a 124-114 Game 1 victory on Thursday night. This contest, for the most part, was truly a back-and-forth affair. Entering the matchup as the biggest favorites in 16 years for an NBA Finals series, many suspected the Warriors to run away with an easy routing on their home floor. Be that as it may, “King James” and his teammates wouldn’t go out without a fight. James appeared to be in full “super saiyan” mode for the majority of the night, hitting all of his first six shots and starting 11-for-13 from the field. Scoring his personal NBA Finals career-high of 51 points, James was simply a one-man wrecking crew, and he did so in a variety of methods. Whether it was driving into the paint for an easy layup or draining a three-point jumper 24 feet from the basket, the three-time NBA champion and former Finals MVP found multiple ways to showcase his diverse skill set. Along with these totals, James finished with eight assists and eight rebounds, further cementing his status as the best player in the world. Providing a little bit of assistance for their superstar, the Cavaliers’ supporting cast provided an admirable effort as well. While being the receivers of extreme criticism throughout the duration of the playoffs, James’s teammates gave solid contributions by out-rebounding the Warriors (53 to 38) and rotating well on defensive. Without a doubt, the most notable of the bunch was forward Kevin Love. Starting in his first game since passing concussion protocol from a head injury sustained in Game 6 of the Eastern Conference Finals against the Boston Celtics, Love provided the Cavaliers with a much needed interior presence, finishing with 21 points and 13 rebounds on 9-for-20 shooting. Despite Cleveland’s best efforts, Golden State has so many weapons that no team can fully shut them down offensively. The only thing that can be done is to try to contain them with the hopes of slowing them down. Stephen Curry, Kevin Durant and Klay Thompson were the standouts of the night, scoring 29 points, 26 points and 24 points respectively on a combined 27-for-61 shooting (44.3 percent). Being a relatively close game for the first three and half quarters, tension started to peek as Draymond Green and Curry made back-to-back threes, giving the Warriors a slight 100-94 edge with 4:37 remaining. Following a quick timeout, Cleveland would respond by going on a 10-2 run, acquiring 104-102 advantage with less than a minute left. Due to a controversial foul call on LeBron James with 36.4 seconds remaining, Kevin Durant would go to the free throw stripe and make both free throws, tying the game. In the immediate aftermath, LeBron would storm down the court and drive hard towards the basket, double clutching his shot and making the difficult layup. Promptly reacting, Curry would return the favor and complete a clutch three-point play with 23.5 seconds left. During the subsequent possession, Cleveland starting point guard George Hill gets fouled with 4.7 seconds left on the clock and is sent to the free throw line, but only proceeds to make one out of the two shots. Remarkably, J.R. Smith gets the offensive rebound, but questionably decides to dribble the ball towards to the perimeter of play. Seemingly unaware that the game was tied at that point in time, Smith makes a regrettable mistake that would ultimately doom the Cavaliers. Per usual, LeBron was LeBron, but at a historic level. Consistent with numerous performances thus far in the playoffs, James was spectacular. Ending the game with 51 points (fifth most in NBA Finals history), eight rebounds and eight assists on a 19-for-32 shooting spectacle, James tied Michael Jordan’s all-time record for the most 30-point games in NBA playoff history (129). Even though “King James” performed valiantly, it still wasn’t enough. When speaking of James’s performance, Cleveland head coach Tyrone Lue stated that with the way he played, “to come up robbed, it's just not right." Furthermore, Stephen Curry was instrumental for his team’s victory. Finishing with 29 points, nine assists and six rebounds on 11-for-23 shooting, Curry was the one who gave the Warriors a late lead with 23.5 seconds left, as well as constantly helped his team maintain the momentum in the second half. As the Cavaliers had final possession of the ball, trailing by one point with time quickly dwindling away, George Hill was fouled with 4.7 seconds remaining, giving Cleveland the chance to take the lead at the free throw line. Now, this is when things get really interesting. After successfully knocking down the first one with ease, the second free throw was slightly off target, eventually landing into J.R. Smith’s hands off of a timely offensive rebound, awarding the Cavaliers with one final opportunity in the closing seconds. In probably one of the biggest blunders in the history of basketball, Smith seemed to think that the Cavaliers were winning at that moment. “I thought we were ahead,” Smith said to James shortly after the play was over. Rather than becoming Cleveland’s hero of the night, Smith displayed such an inexcusable lack of basketball awareness in that moment that it can almost be considered as objectively comical. In Smith’s defense though, many factors besides his own wrongdoing played into Cleveland’s eventual defeat. If the officiating crew had not have controversially overturned the initial charging call drawn by James with 36.4 seconds left, the Cavaliers would be up by two points with the ball. If Hill had made that second free throw in those final moments, Cleveland might have defensively smothered Golden State’s last possession in its track, resulting in a monumental opening game upset. However, things didn’t turn out that way. Quickly afterwards, the Warriors would commence to run their opposition out of the gym in the overtime period, culminating into a disappointing loss for the Cavaliers. Considering that this was the first game of the NBA Finals, its safe to say that this particular contest was really important. Following a demoralizing loss like this, how will the Cavaliers react in Game 2? Well, with so much talent on the floor at once, who knows what’s going to happen? Both teams will return to action at Oracle Arena on Sunday night at 8 p.m. Game 2 will be televised on ABC.